The Stavros S. Niarchos Foundation for their generous grant towards the creation of the Universal Leonardo web site. The Council of Europe for their support with the exhibition programme . Prof. Martin Kemp for agreeing to reproduce on this web site his bibliography on Leonardo and an abridged version of the chronology on Leonardo, which both appear in his book Leonardo (Oxford, 2004). The scientists of the Opificio delle Pietre Dure, Florence, for their time and expertise. Nanne Dekking of Wildenstein NY, for his collaboration. Gheri Sackler for her support. Bill Gates and Fred Schroeder of Resnicow Schroeder for their support. Paul Williams of Stanton Williams Architects. Oxford University Press for their support with the London launch of Universal Leonardo. Francis Wells for his advice on Leonardo's heart drawings. The students from Southbank International School, Grade 8 (8Ke and 8Pl), for their help and feedback on testing the activities in the Play section of this web site. 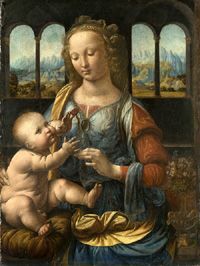 All the individuals and institutions who have kindly given us permission to reproduce images of Leonardo works in their possession, whose names are acknowledged next to each image. Central Saint Martins College of Art and Design, The University of the Arts, London.